The American Gold Eagle is one of the most valuable and historic coins in the entire world. The coin has not actually been in circulation for all that long, having first debuted in 1986. As is the case with all gold coins, the American Eagle is produced by the national mint of its respective country, which is the United States Mint. After the coins are produced by the mint, they are then sold and distributed to various dealers and companies around the world. A unique characteristic of the Gold Eagle is that all of the materials used to create each coin are required to come from within mines in the United States. This is a condition that was enacted by the US government and is considered law. As a result, there have been times where the Eagle has seen shortages due to the inability of the United States to provide ample raw bullion. 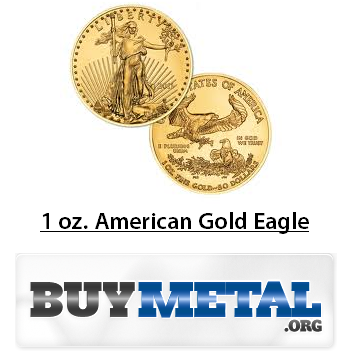 Each and every American Gold Eagle coin follows the same specifications in metal makeup. The coins consist of 91.67% gold, which is 22 karat, 3% silver, and another 5.33% that is built out of copper. As a result of the slightly skewed numbers, each coin weighs a fraction more than what the displayed weight indicates. The American Eagle comes in four different primary varieties. The first and smallest weight of the coin is 1/10th of an ounce. Though they do not weigh very much, they still maintain a diameter of 16.50 mm and a thickness of 1.19 mm. The precise weight of the 1/10 oz. coins is 0.1091 troy ounces, which translates to 3.393 grams. All 1/10 oz. coins carry a face value of $5. The second version of the Gold Eagle is 1/4 ounce. These coins are moderately larger than their 1/10 oz. counterpart. With a diameter of 22 mm and a thickness of 1.83 mm, these coins weigh in at exactly 0.2727 troy oz., which is the equivalent of 8.483 grams. Though the weight is more than double the 10 oz. coins, the face value is set at a 2x multiplier, or $10. The closest step to a full ounce coin is a 1/2 oz. Eagle. These are among the most popular coins due to their substantial volume in gold mass, but lower price in relation the oz. version. The diameter of the half ounce coins is 27 mm, with a thickness of 2.24 mm, and a weight of 0.5454 troy oz., or 16.965 grams. The actual real currency value of the coin is $25. 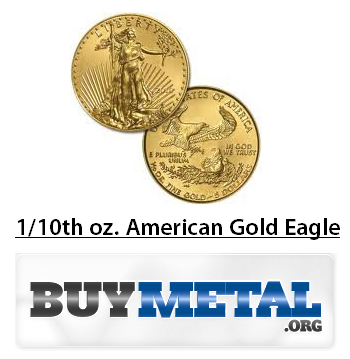 The most sought after Gold Eagle, without a doubt, is the 1 oz. coin. These pieces size up at 32.70 mm, carry a thickness of 2.87 mm and have a precise weight of 1.0909 troy ounces, which translates to 33.930 grams. The 1 oz. American Eagles have the highest value in terms of gold worth, and they also adorn the largest face value, sitting at $50. The dollar values listed on each of the coins represents how much they would be worth if they were to be used as actual currency. Of course, their actual value in gold far exceeds what they are worth on the face. Buying American Gold Eagles online is very easy to do, but you should know what you are looking for. If you are a new investor or collector, your best bet would be to acquire a few of the smaller coins, namely the 1/10 and 1/4 oz. varieties. Though these will never be a bad purchase, buying 1 oz. coins can become very costly and very quickly. Because of the collectible nature of American Eagles, there is almost always going to be a premium attached to their price. You will not be able to buy Eagles at spot price. In most cases, generic Gold Eagles will be priced from $30-$100 over spot price. The more collectible that the coin is, the more that will be tacked onto spot price. This does not make them a waste of money, however, as this initial investment will be easily recouped should you ever decide to sell. Most every reputable online gold dealer will have many different Eagles available for purchase. Buy the type of coin that best fits your budget and there is little chance that you will go wrong.